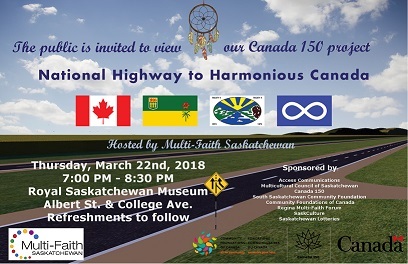 Multi-Faith Saskatchewan (MFS) and the Multicultural Council of Saskatchewan (MCoS) will hold a public viewing of the “National Highway to Harmonious Canada,” on Thursday, March 22 in Royal Saskatchewan Museum, Regina. The 45-minute video features children of diverse faiths and ethnic backgrounds bringing greetings from their communities and displaying highway signs of their hopes and dreams of a harmonious Canada. Also included in the video will be cultural presentations and silent prayers from various faiths. The video will be shown in conjunction with the International Day for the Elimination of Racial Discrimination. This event is open to the public and is free of charge. The program will be from 7 p.m. till 8:30 p.m. The museum is located on the corner of Albert Street and College Avenue. The project is a collaboration between the MCoS and Multi-Faith Saskatchewan, with the support of Regina Multi-Faith Forum, Canada 150, South Saskatchewan Community Foundation, Community Foundations of Canada, SaskCulture, Saskatchewan Lotteries, and Luther College. It was also supported by local cultural, faith and immigrant settlement agencies such as Regina Open Door Society and Regina Immigrant Women Centre, as well as North Central Family Centre. The 86 participants in the show included dancers and drummers from the First Nations and Métis community. Access Communications Co-operative donated its technical services and studio for the filming of the video. The project also received support from Westminster United Church, Regina, that donated rehearsal space. After receiving funding in July, the project was largely complete by year end and was launched at a small viewing in Luther College in January. “This larger public viewing is an opportunity to engage all residents of the community to witness the message of the community’s youth for peace and harmony,” says Krishan Kapila, co-chair of the project committee.